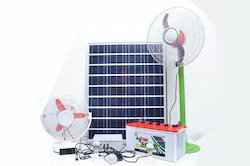 We are manufacturers of Solar Home Lights that convert solar power energy straight to electricity, which is then stored in personal batteries that can be made use of whenever necessary. The complete product variety offered by us is technically advances and appropriately works in non-electrified areas as urgent situation lighting system. Because of its various characteristics, these are extensively used in domestic, profitable and industrial applications. With huge knowledge of the domain, we are offering a broad variety of Solar Home Light System to our customers. Precisely engineered, these systems are perfect to be used in remote areas where electricity is not reached yet.